I put this together for dinner this evening and really liked the combination of ingredients. The potatoes tasted creamy and were boosted by the sea salt and slight kick of the spring onions. 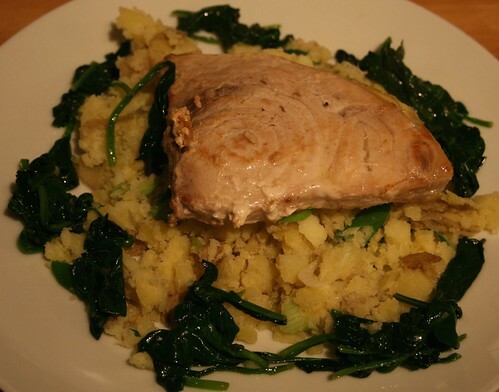 Buttered spinach and lemon juice are perfect with fish anyway but they also complimented the potato dish. I adapted the potato recipe from a Gordon Ramsay one. I used charlotte potatoes which I boiled until tender and drained. 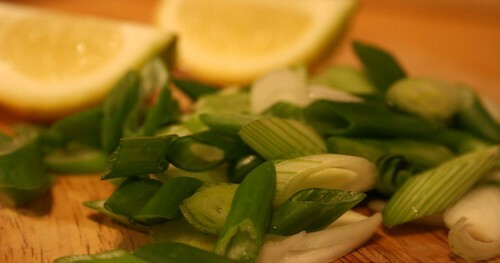 I then crushed them with a fork and mixed in sea salt and a couple of sliced spring onions. 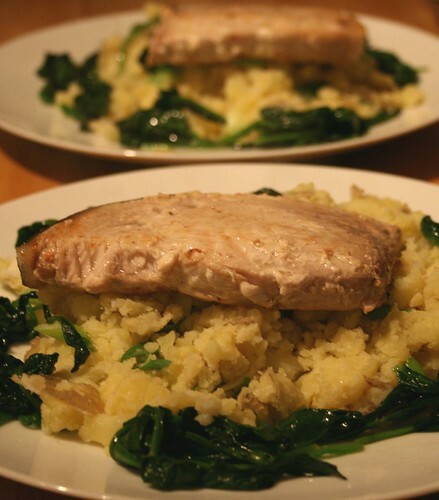 The swordfish was pan fried in olive oil for about 5 minutes each side and then I squeezed over some lemon juice. I wilted the spinach in a saucepan over a low heat with a knob of butter, and squeezed the excess liquid out before serving. Next Post Who Ate All The Grapes?